The Auckland War Memorial Museum Digital Practice team has been watching the development of e-Ink display technology for some time. We were curious to know if the medium could help us deliver an enhanced in-gallery experience and provide a means to publish a personalised experience to our visitors. Also, could the technology help support our goal to create a sustainable, Create Once Publish Everywhere (COPE) content production workflow while also easing the remedial label creation cycle for our exhibition and display teams? In 2015, we embarked on a project to test these assumptions with our ‘AM Live Label’ project. To power our project, we paired up the Visionect server software and two e-ink displays with our existing GatherContent account API to compose, edit and deliver the content. This setup, focused on quick iterative testing and a collaborative online workspace, allowed us to draw together the experience of teams from across the Museum, including Curators, Display, Digital Practice and Exhibitions. 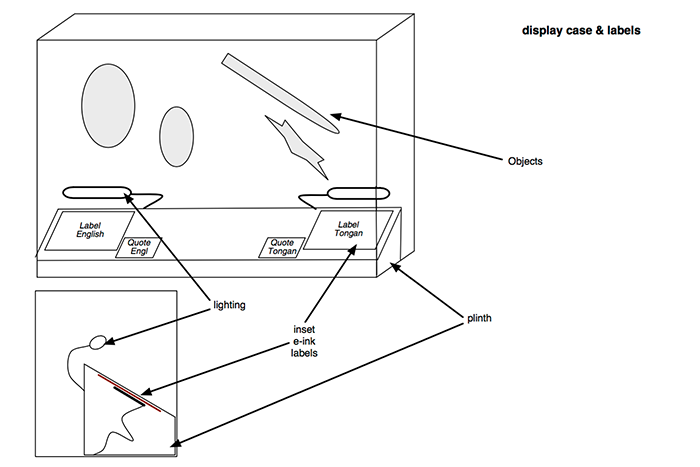 A plan showing how the digital labels would be incorporated into the display case. After a successful lightweight test in an exhibition community space, an opportunity arose to take the displays deeper into the gallery. An upcoming display case featuring regular change-outs of artefacts from Auckland Museum’s Pacific collection and the accompanying regular label updates proved to be the perfect candidate. 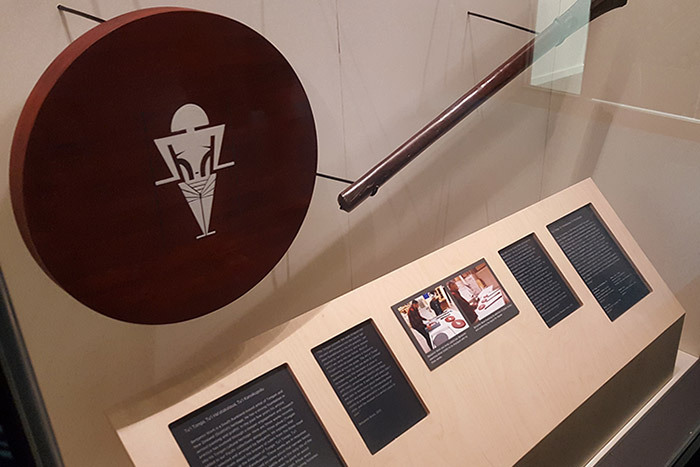 The first group of objects scheduled for the case were from Tonga and so a key part of our brief focused on providing visitors with side-by-side Tongan-English translations of the gallery labels. 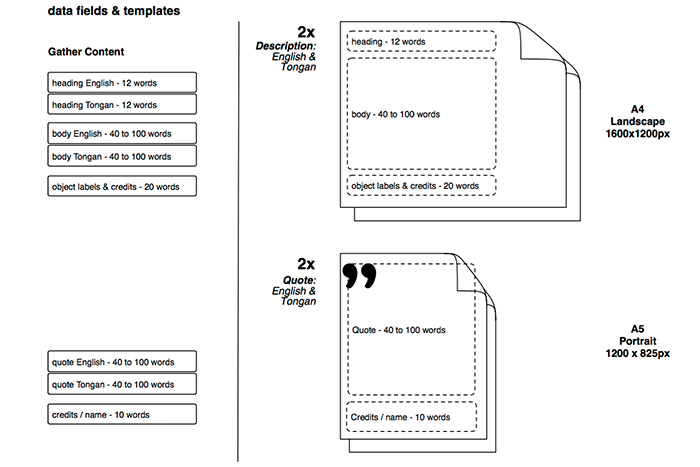 Wireframe showing how the digital labels would be formatted to support bilingual copy. 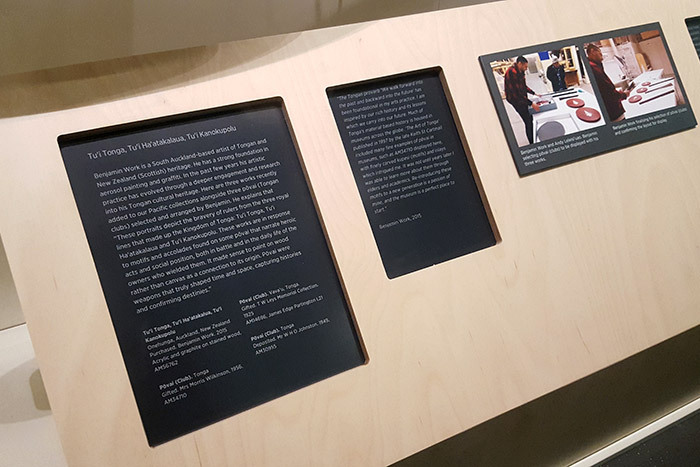 Our curatorial team developed the content and translations, which was then created as a custom content type to be served to the e-Ink display via an API. Our Display team helped create a natural, flush mounts for the displays. The displays have been running continuously for months now, and look so natural that colleagues and visitors are surprised to learn they’re digital. The newly installed digital gallery labels offered in Tongan and English. With the setup complete, the work involved to create labels for the next change-out is reduced to a simple web update. We’re looking forward to extending this project with features like publishing personalised (language-specific) content for visitors. Close-up of the digital gallery labels in action.